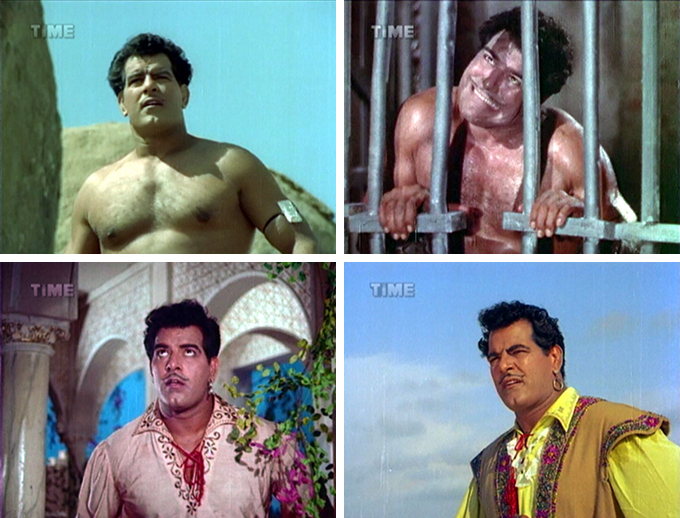 Let’s face it: Dara Singh is reason enough for me to watch any film, and when the rare subtitled one comes along it’s practically Diwali in my household. So you will understand how much it pains me to say this, but Lootera is a really bad movie. How can a Dara pirate (subtitled “sea dacoit”) film be bad? I am not sure. But Dara and heroine Nishi have zero chemistry, unlike the better if rather less complete Nasihat, and the pacing is just abysmal. The writers keep writing themselves into corners from which they can only escape with overly glib plot developments, and the director fails to understand which parts of the story he should be lavishing time and attention on. It even manages to be sexist, and these sorts of movies are usually a refuge from that. There were enough things to get me through it: Dara’s ruffled sea dacoit shirts, Prithviraj Kapoor, dancer Kammo as a female sea dacoit, lots of sparkle and terrible wigs, and lovely songs including a Bela Bose dance aboard a sea dacoit ship. Plus the subtitles, inept as they are, are often hilarious. And when I tell you that Memsaab favorites Hiralal, Jeevan and Rajan Haksar vigorously ply their histrionic powers you will understand that subtlety is no hallmark of the acting either (yes, I know I am putting that in the “plus” column, it needs the support).